Occasionally I have the need for a network card to operate as though it has a live network connection, without it actually being connected to a network. Typically for testing purposes, and occasionally for specific software configurations. To do this I needed a quick and easy way to make a loopback connector. Something small enough to keep in my PC toolkit, yet large enough that it wouldn’t be lost. Mine ended up about the size of a ballpoint pen. The following is a quick “how to” for making an Ethernet loopback connector. To build this particular loopback connector you will need one (1) spare Category 5e (cat5) cable. 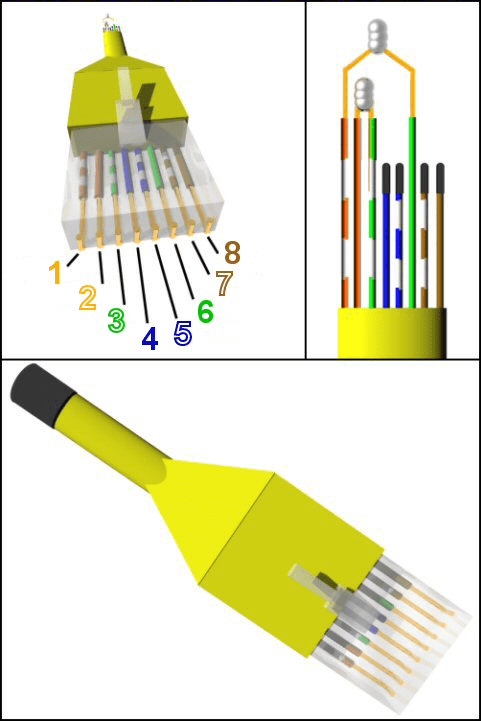 Cut 4 or 5 inches of the end off a network cable, keeping the connector intact. Tape the end down to make it look presentable. Plug RJ-45 plug into your Network Card. Updated April 19, 2011 – Added Gigabit Loopback Information. You did a very nice 3D work out there, but you put the wires in the wrong order. Nice work, also after soldering you can protect the soldered points using a hot glue gun, tape is good but sometimes the insulation tape peels off which isn’t a great thing, hot glue can last for ages and is a good insulator. I can’t think of any reason not too, it’s pretty low power. I use heat shrink tubing on mine usually. On a standalone Windows XP machine, I can use this cable and type IPCONFIG to see my static IP address. However, under Windows 7, IPCONFIG shows no IP address. How can I make Windows 7 report the static IP address? The Windows 7 machine had a 1 GB/sec ethernet card. Configuring the ethernet for 100 MB/sec solved the problem.